Roxanne and Zach are one of those rare couples. When they looked at each other, everything surrounding seemed to disappear. Their joy in each other was so obvious, it made me smile the entire day. That, and my love for Roxanne's sweet vintage-look wedding dress and Zach's gorgeous plaid blue suit! 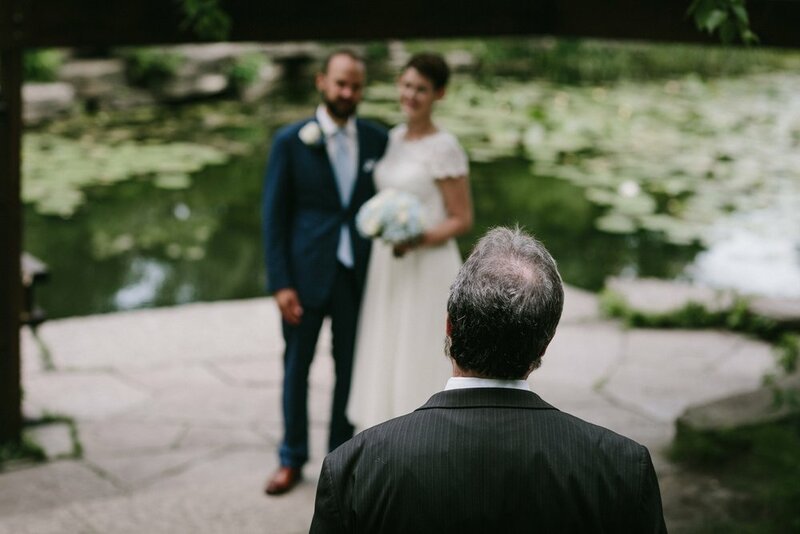 They celebrated their wedding day with a brief ceremony at the Alfred Caldwell Lily Pool inside Lincoln Park, alongside each of their families. It was 106 degrees in Chicago that day, so after the ceremony (staying in shade as much as we could!) we strolled through Lincoln Park, ending the day at Roxanne's mother's apartment for a champagne toast a few blocks away. Cheers!